I looked through Mom’s collection of 3 x 5 index recipe cards one more time. Surely, I’d find her corn bread dressing recipe. Surely, Mom wrote it down and filed it in her wooden recipe box. Surely, I overlooked it when I searched before. Thanksgiving is about traditional foods that have been served by grandmothers, mothers, sisters, aunts, and cousins. Mom always made the dressing to go with the turkey and giblet gravy, and after her death more than twenty-five years ago, I used recipes from cookbooks to make it for family gatherings. Last week I touched every recipe card in Mom’s file. The one recipe I wanted wasn’t there. I’ve determined the reason is the recipe was in her head. She seasoned by taste and added broth by feel. But I discovered something I hadn’t noticed previously. Almost every recipe includes two ingredients: sugar and butter. And many include flour. Mom’s file is full of desserts: pies, cookies, cakes, and candies. Those are the labeled tab dividers. The tab labeled casserole doesn’t have a single card behind it, but Mom added another category: Rolls, Biscuits, Cornbread. She was a meat- and-three cook, a really good one, and she didn’t need recipes except for desserts and some breads. Her fried chicken and chicken and dumplings were the best ever. She cooked fall-apart beef roast in a pressure cooker and smothered liver with onions. She fried tender pork chops in a black skillet, then used the drippings for gravy. No recipes needed. I also discovered Mom and I collected many of the same recipes, and I don’t know why I didn’t get them from her. Pecan Pie. Oatmeal Cookies. Angel Biscuits. Chess Squares. Sugar Cookies. Her Old Southern Light Cornbread recipe is exactly like the one I cut from a Southern Living magazine. 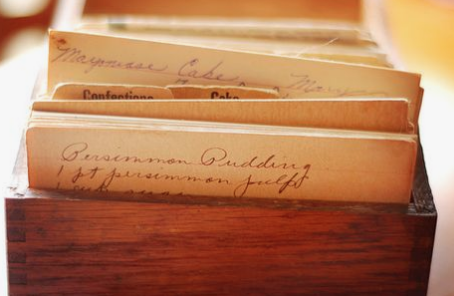 Like most cooks of her generation, Mom recorded many recipes using paper and pen. Reading her handwriting brings a lump to my throat. She wrote neatly and concisely, omitting every ‘the, an, a’ and her directions were simple. The last notes on most cards are numbers, such as 350º, 45 minutes. For our family’s Thanksgiving Dinner tomorrow, I’ll have to use the corn bread dressing recipe I’ve created, combining several recipes, and titled “Dressing Most like Mom’s.” But the pecan pie I’ll serve my cousins and sister-in-law and their children will be exactly like Mom’s. As close as I can make it.